A fresh start in a new home sounds wonderful, and it is. Still, figuring out where you should begin with your new modern home interior design can be overwhelming. 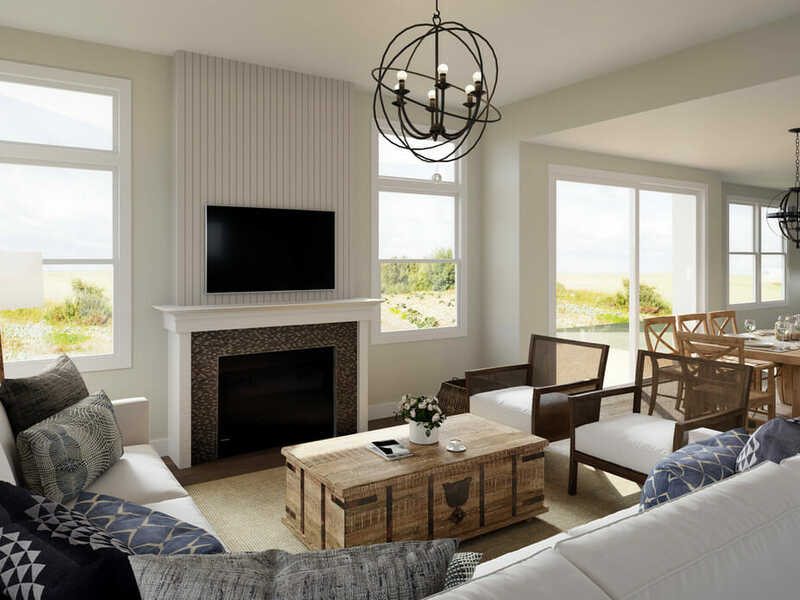 One recent Decorilla client knew their starting point would be the living room but they needed a few designer tips and tricks to overcome their design challenges. 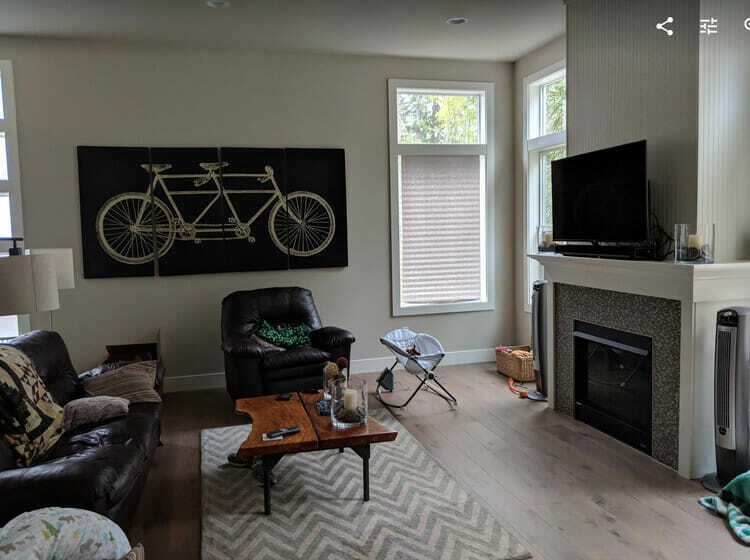 Two brand new homeowners desperately needed interior design help with their home. As a preliminary step, the clients chose to start with one room with the aim of tackling the rest of the house in the near future. The client shared images of their favorite interiors with the Decorilla team to help the designers get a sense of their style preference. A neutral palette and modern house floor plans are ever-present in the rooms the clients chose. The light greys and raw wood with sisal have a distinct modern farmhouse vibe. The client’s clear vision would go on to help the interior designer with their modern home interior design task. 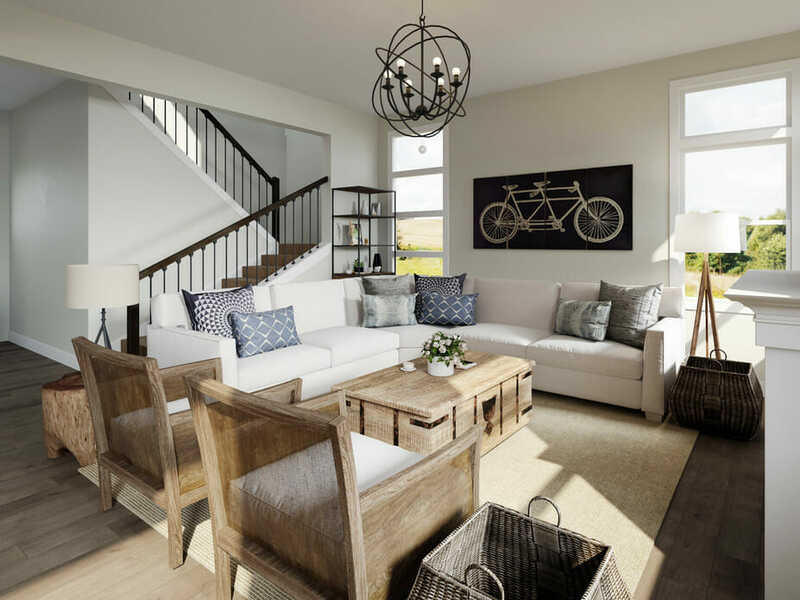 Once the designers had the clients’ brief they got to work on their design concepts to create a modern farmhouse perfect for the young family. The initial proposals were filled with raw wood and natural textures. However, Tamna’s light-filled interpretation with bursts of blue captured what the clients were after. From there Tamna was able to help navigate the clients’ new modern home interior design with ease, with her focus on making a bright open-plan living space for the family. 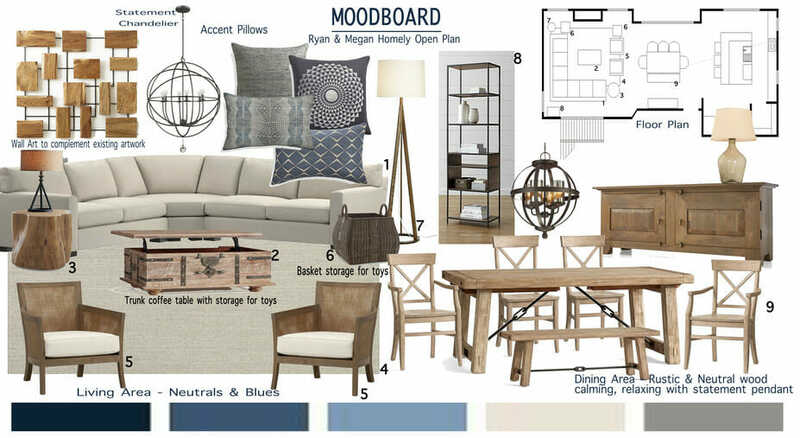 The initial mood board was filled with sandy and blond wood tones, and complementary blue accent pillows. Blues and browns create a serene and calming environment, similar to that of a seaside setting. Tamna added industrial elements in the feature pendant lights, bookshelf, and coffee table to bring the open plan together. By using modern and contemporary elements, the designer would go on to create a lively interior. Before the living room was bland and uninspired. The clients did have a unique wood coffee table with natural edges and steel fixtures that inspired the interior designer to incorporate rugged wood and industrial elements into her design. The outcome is sophisticated, yet, laid-back family room with modern home décor. 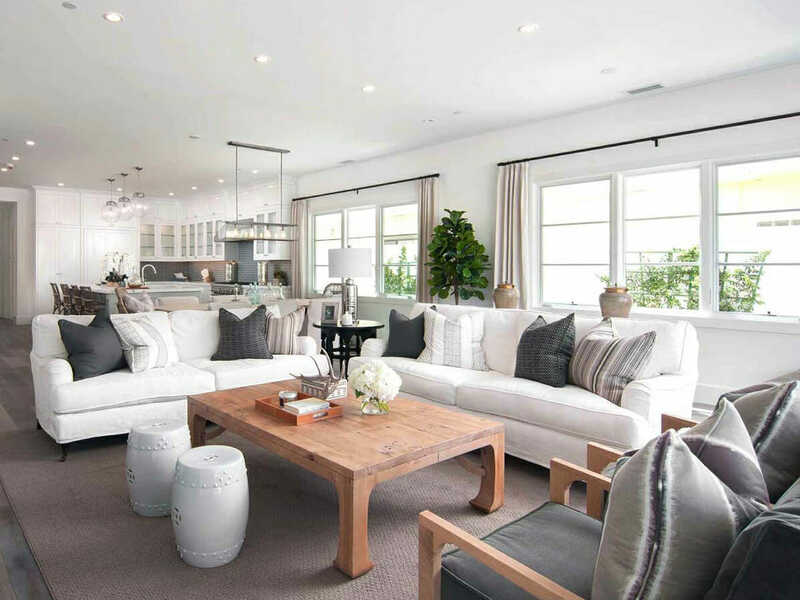 A taupe sectional cleverly enhances the open-plan atmosphere as it doesn’t block off the area. Blue scatter cushions add definition and calm, while their silvery geometric print brings a shimmery touch of contemporary into the design. Auburn baskets help to bridge the gap between the light and dark features in the living room. A rugged solid wood accent table and unique farmhouse coffee trunk add the much needed rustic farmhouse look to the modern home décor. The clients required a multi-purpose space that could cater to work and family life, and the coffee table delivers. The farmhouse table is an innovative piece has a hinged top that can lift up to double as a worktop or games table and has loads of space for storing toys and pet accessories. The chairs have a modern style and an arts and crafts twist with rattan backs and side panels. A sisal linen rug further enhances the raw textures. The natural fiber is not only lovely underfoot, but it is also very durable and grounds the modern house floorplan. Loads of natural light bounces off of the off-white walls making the space feel even larger and more open than before. Lovely natural wood elements continue into the dining area, with a stunning wood statement piece. 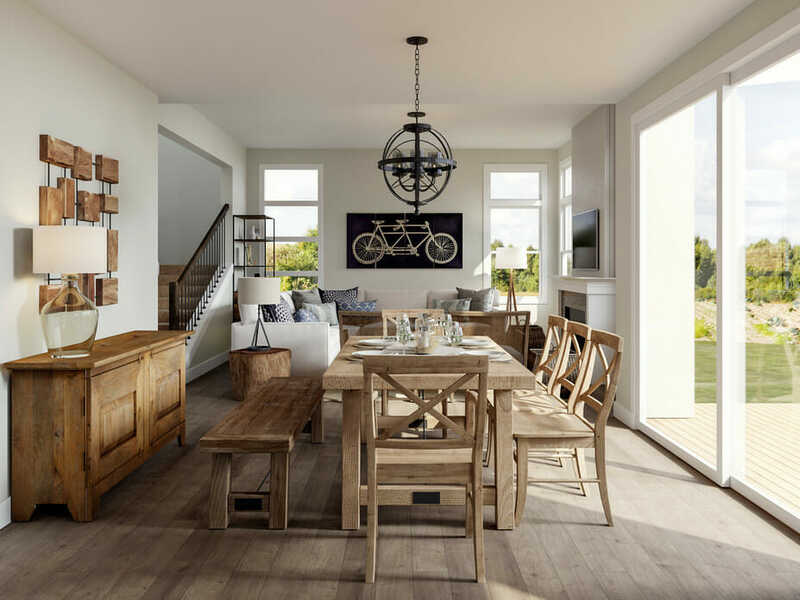 The designer chose a farmhouse style bench instead of chairs and the result boosts the open plan layout. Tamna chose a steel frame bookshelf and industrial style chandeliers to pick up the dramatic black from the clients’ bicycle canvas. 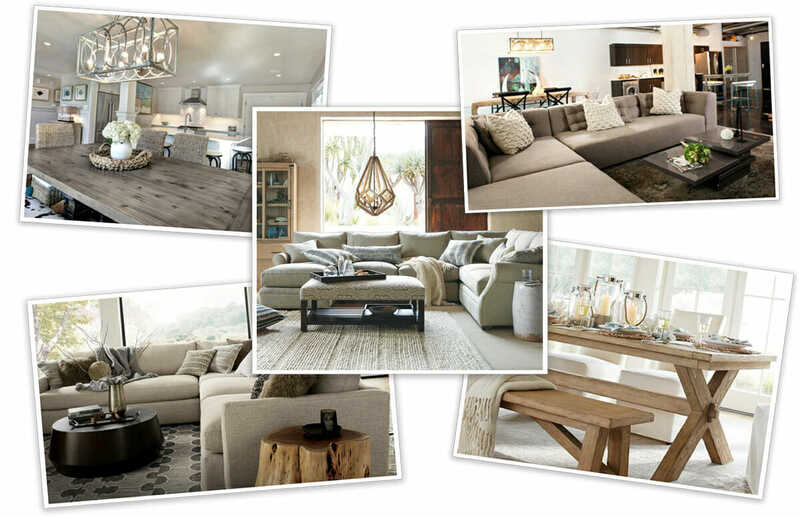 These elements bring a masculine aesthetic to the natural modern home décor and pull the room together. Now, Decorilla’s clients have a welcoming home that is perfect for their growing family as well as entertaining friends. The modern house plan is open, which mean individuals will feel integrated. 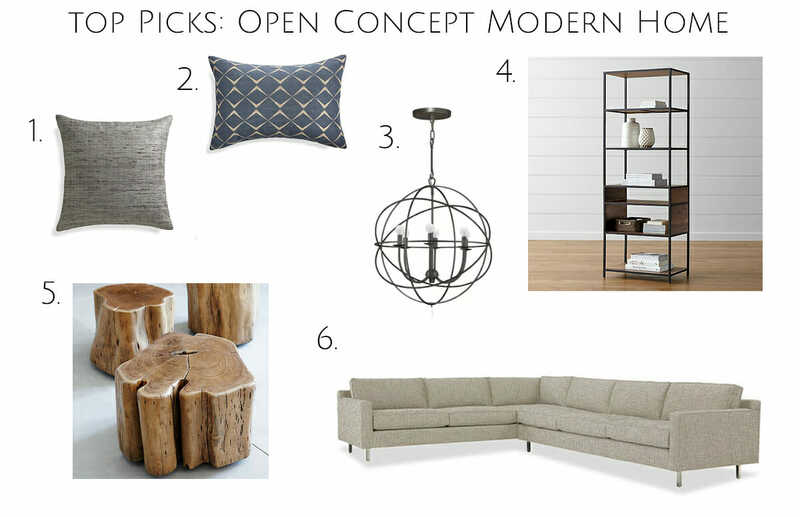 Has our interior designer’s modern farmhouse inspired you to start with your home project? 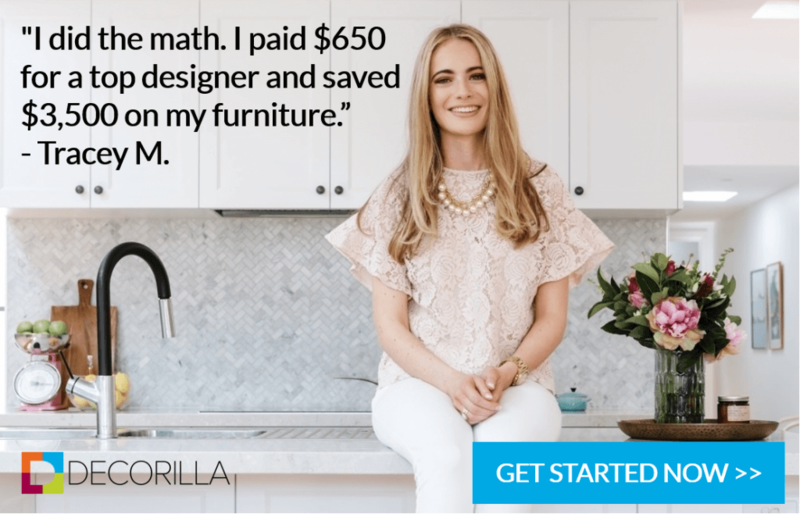 Schedule a free consultation with Decorilla’s helpful design team to help you get started!